GOTR in Red Wing, Minn.
Chicago likes to do things big. We have some of the tallest buildings in the country. We have one of the largest--and one of the most spectacular, I might add--Whole Foods Markets. We've set a Guinness World Record for the largest triathlon, August's Chicago Tri has drawn about 8,000 competitors, and our Bank of America Chicago Marathon is known as one of the biggies in North America. So it didn't come as much of a surprise when I read that our city's branch of Girls on the Run is shooting to be the largest ever when it kicks off tomorrow morning. But we're not talking about it being the largest New Balance Girls on the Run 5K that Chicago has ever had. It's aiming to be the largest in the world. Girls on the Run Chicago only needs 6,301 people to be registered to receive that honor. And between the 3,000 girls in the group, which encourages young girls to live healthy lives and have self-respect through a 12-week running program, plus their coaches, parents, friends and the general public who want to support this mission, the race is getting close to that milestone. The 5K kicks off tomorrow morning at 9 a.m. at Montrose Harbor along the Chicago Lakefront. Beware about trying to park onsite...that Montrose parking lot fills out pretty fast on any race-day morning but with a nice weekend ahead, girls being bussed to the start and a lot of people for a relatively small space, you're better off arriving by bike, foot, or public transportation. The morning promises to be a fun one for all involved. It's an amazing site to see these girls geared up for the race--for many it's their first 5K--and their cheerleaders, ready to watch them reach their goal. To keep the competition from getting out of hand, everyone is a winner at this race, with a clock running but no one really caring about how fast or slow they take it out there--makes sense, right? And if you are that lucky 6,301st registrant, the one who's responsible for bringing the race over that record-setting line, you'll go home with a special prize. No word yet on what it is, but Girls on the Run has a lot of great sponsors so it should be good. What are you waiting for? Online registration closes at 5 p.m. today or you can register on site tomorrow morning, beginning at 7 a.m. Registration costs $35, which goes back to providing all of this great programming for the girls. For more details, check out www.gotrchicago.org or click here to register. Photo grabbed from chief_huddleston at flickr. I'm such a huge supporter of GOTR and love this .... awesome!! Wish I could've made the drive down to participate!!!! Aw, thanks for reading! GOTR is awesome but it was sad to see rain falling right around the time the run was ending. 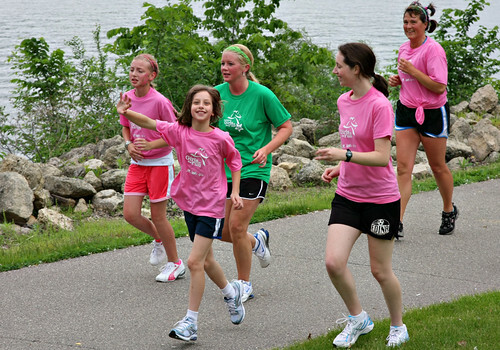 do you have a GOTR near you? there were several 5Ks around the country this weekend and gotr.org also listed others, but a majority were in May. Maybe next year? Or come down in the fall for GOTR part 2 at the Chicago Fire stadium.